Therefore, beloved, anticipating these things, be diligent to be found by him in peace, without spot and blameless. So, my dearly loved ones, while you are waiting for these things [to happen], do your best to be found at peace with God, pure and blameless in His sight. 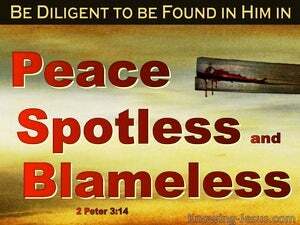 Therefore, beloved, since you look for these things, be diligent to be found by him in peace, spotless and blameless. Wherefore, beloved, expecting these things, diligently endeavor to be found of him spotless, and irreproachable, in peace. Therefore, dear friends, while waiting for this, make every effort to be found by him unstained, irreproachable, and at peace. Wherefore, beloved, seeing ye look for these things, labour to be found of him in peace, without spot and blameless. Wherefore, dearly beloved, expecting these, be earnest, spotless and blameless, to be found by him in peace. Therefore, dear friends, [because you] are waiting for these [things], make every effort to be found at peace, spotless and unblemished in him. 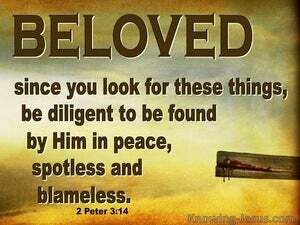 Therefore, beloved, looking for these things, be diligent, spotless, and without blemish, to be found by Him in peace. Then, beloved, as you are expecting this, be eager to be found by him unspotted and unblemished in serene assurance. And so, beloved, since you are looking for these things, continually give diligence that you may be found in peace, unspotted and blameless in his sight. Wherefore, beloved, seeing ye are expecting these things, be diligent to be found of him in peace, spotless and blameless. Therefore, dear friends, in expectation of these things, make every effort to be found by him spotless, blameless, and at peace. Therefore, dearly beloved, since you are expecting this, be in earnest to be found by Him without a blot, without reproach, and at peace. Wherefore, beloved, since ye are looking for these things, give diligence that ye be found in peace, without spot and blameless in His sight.